A Very Merry Disney Christmas! 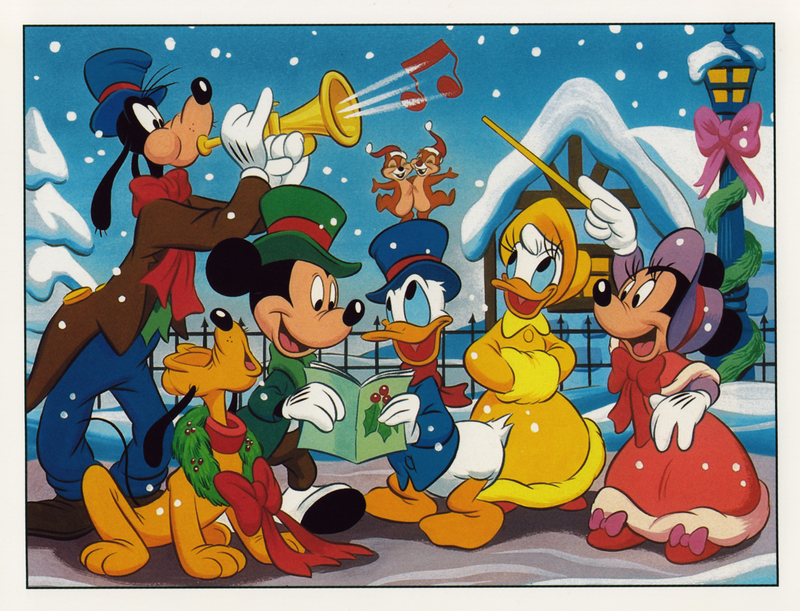 This set of Disney character Christmas cards goes back nearly 20 years ago, I believe. They were commissioned by a Disney licensee by the name of G.G. Genal, as I had made the acquaintance of the founder of the company, the charming Gloria Aleff, at a Disneyana convention several years prior, and she was hoping we could work together on a project one day. 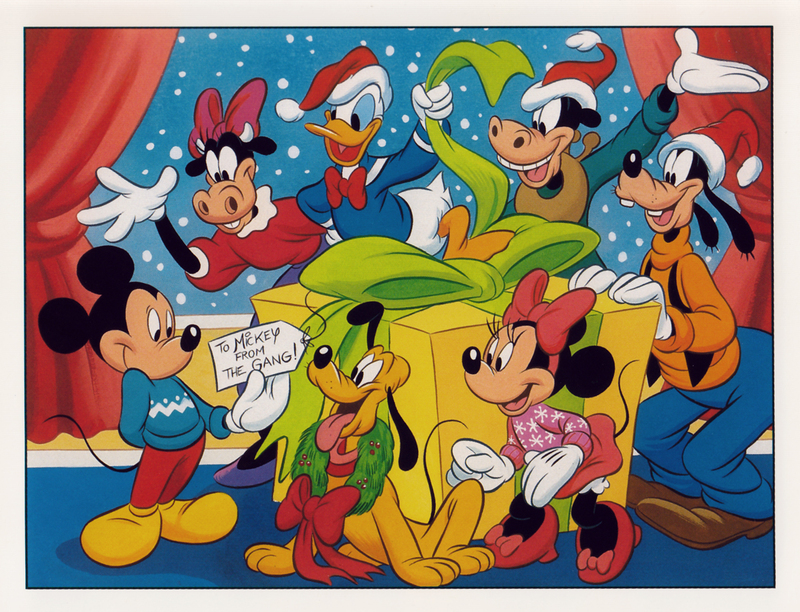 If I'm not mistaken, I illustrated these cards about 1995 or 1996, within a couple years after I'd left my job at Walt Disney World in Florida to return to Canada and continue illustrating for Disney in a freelance capacity. They were being created exclusively for sale through the Disney Stores at that time. My stylistic approach to illustrating Mickey and the other standard Disney characters was primarily based on how they looked in the early 1940s, specifically in the handful of cartoons produced in 1941 and 1942 that were directed by Riley Thomson. The animators in his unit who worked on these included Ward Kimball, Fred Moore, and Walt Kelly, who would soon thereafter leave Disney to go create his famous comic strip character, Pogo Possum. These guys also had a reputation for getting sloshed on their lunch breaks, leading to highly spirited and very funny animation (with incredibly dynamic poses and expressions), with the resulting shorts being nicknamed the "Drunk Mickey" cartoons! It was also in two of these cartoons, Mickey's Birthday Party and Symphony Hour, that Clarabelle Cow and Horace Horsecollar enjoyed a brief revival, but would pretty much disappear again from the shorts after this. The other goal in illustrating these Christmas cards was to capture the warm, cozy feel of the Disney publicity art that had been created by the brilliant Hank Porter, such as his artwork for the Disney pages in Good Housekeeping Magazine in the early 1940s. I always felt that Porter's art had every bit as much visual appeal as that of the legendary animator, Fred Moore, yet he is largely unknown to the general public. All of these were painted using gouache on illustration board, by the way, as this is still my preferred medium even in this age of digitally created art. Frankly, I wouldn't even know how to achieve the same results using Photoshop and, unless one uses a Cintiq, I wouldn't even have the type of control necessary to do it digitally. Besides, I just happen to prefer the look of real paint on board, aesthetically! Finally, here is the logo featuring Mickey and Minnie that appeared on the back of each of the three illustrated cards. I've enlarged it considerably from its printed dimensions of approximately 1 1/2" in diameter, so it's a bit blurry as a result. 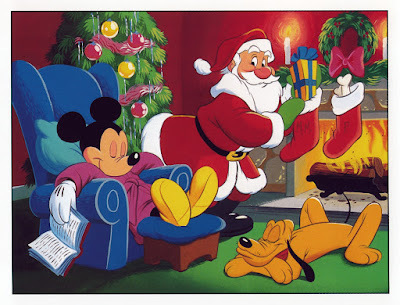 This will likely be my last post before the 25th, so a Merry Christmas to all of my blog readers! 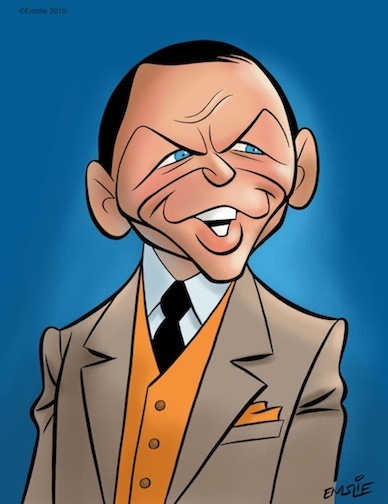 I've written of my admiration for Frank Sinatra many times on The Cartoon Cave. In fact, my very first post when I launched this blog back in June 2007 made reference to his influence on my tastes in entertainment. For me, no other American entertainer better represents the 20th Century. He will always be the ultimate interpreter of The Great American Songbook - that vast catalogue of song standards composed by the likes of George Gershwin, Cole Porter, Johnny Mercer, and many others. And then there was the songwriting team of Sammy Cahn and Jimmy Van Heusen, who wrote many of Frank's biggest hits, such as Come Fly With Me, Call Me Irresponsible, and the heartbreakingly beautiful All The Way, one of my favourites. It's incredible to believe that Dec. 12 2015 is the centenary of his birth! My favourite era of entertainment runs from approximately the early 50s through to the end of the 70s, and so it stands to reason that that's also my favourite period of Frank Sinatra's career. Although I can appreciate his early years as the skinny, big-eared, romantic crooner with the Tommy Dorsey band, that era is not nearly as appealing to me as his swinging bachelor image when he reinvented himself in the 1950s, thanks in no small part to his longtime collaboration with conductor/arrangers, Billy May and Nelson Riddle. With their jazzy musical arrangements and Sinatra's tailored suit, tilted fedora (or Trilby, as pictured), Frank had adopted a devil-may-care persona that epitomized the life of the 1950's young urban male. In the early 90s, that image was revived with the newfound interest among Baby Boomers in what was now called "Lounge Music". Though I was a Sinatra fan long before then, I must admit it felt good to see others starting to rediscover the greatness of that mid-20th Century entertainment. Frank Sinatra's music career is what fascinates me the most, as I never tire of listening to his voice and styling of a song, making it his own. But I also enjoy Sinatra greatly as an actor, albeit with some reservation on some of his film choices. Whereas in the recording studio Frank was a perfectionist in his craft, the same could not always be said for his film roles. In his first dramatic acting role (that also boosted his flagging career) as the tragic Maggio in From Here To Eternity (1953), Frank showed he had the acting chops that few would have believed he had previously. There was no longer any doubt of that when he followed up in 1955 with his powerful performance as a drug addicted drummer in The Man With The Golden Arm. My favourites, however, would include the wartime escape drama, Von Ryan's Express, the cold war thriller, The Manchurian Candidate, and I must confess, two of his notoriously lightweight Rat Pack escapades, Ocean's 11 and Robin And The 7 Hoods! 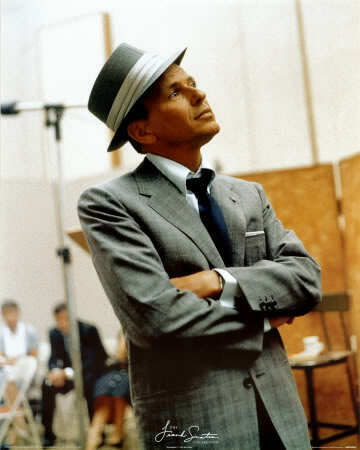 It is in that latter film that Frank has his only onscreen musical collaboration with his Rat Pack pallie, Dean Martin. And if that weren't enough fun, they're joined by Bing Crosby, the legendary crooner who set the standard for all who came after, including Frank and Dean. Here's the three of these great entertainers singing "Style" from the aforementioned Robin And The 7 Hoods, a Chicago gangster spin on the Robin Hood legend. Enjoy!